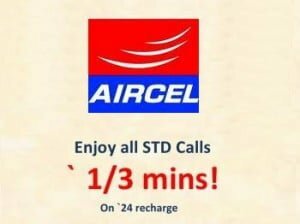 AIRCEL, one of the fastest growing Pan India telecom operator today announced the launch of new STV-24 (Special Tariff voucher) for its prepaid GSM mobile service customer in Mumbai telecom circle to make long distance/ STD Calls at Rs.1 for 3 minute. The STV-24 is priced at Rs.24 wherein one can make STD calls to any numbers across India at Rs.1 for 3 minutes. Remaining tariffs such Local ISD,VAS, etc will be as per the customers existing plan (PPS/PPM). The STD call tariff will be valid for 7 days from the date of recharge. 1. Available only on E-topup. 4. Remaining tariffs such as Other, ISD,VAS, etc will be as per the customer’s existing plan. 5. Pulse rate for STD Calls will be 3 minute. 6. The tariff plan is a minute plan and per second billing customers taking this rate cutter will move to per minute plan for STD calls only. 7. Not applicable on 97 & 99 FRCs & Sath Sath Pack-77. in punjab aircel is using tata gsm network wht the heck…. Good to know that bro ! so can u say that the plan is quite competitive with other operators. Reliance is offering the same with 1 year validity !